This method is where quantum physics meets the spirit world. It is designed to change your world through the spoken word by accessing the inter-connectedness of your soul, mind, consciousness, and the Creator. Ultimately, it will enable you to bring about a new reality of health and harmony and allow healing and transformation into your life. 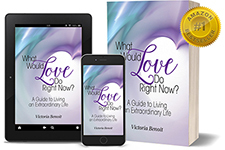 With over 50 healing processes from which to choose, you will be able to resolve your issues and manifest your desired results in the fastest way possible. Another process takes you back to a decision made by another person who caused you to give up the freedom to make your own decisions. From this past point in time, you can restore your freedom to make decisions then choose and accept different pathways that help you on your journey through life to reach your full potential. What will you experience during a healing session? Because all of life is connected, each process contains a common phrase. You will be declaring, “My healing blesses all of creation,” so whatever personal issue being addressed you will first acknowledge that when you bring healing into the world it makes all of creation a little more complete. During a session, you will make three declarations at the beginning of each process, one of which is an intention to manifest your desired results in the fastest way possible. Each session will include as many processes as your soul deems appropriate for your healing. In addition, your soul may choose a unique process using a distinct sequence of numbers as a method for healing, or to assist in the manifestation of an intention in a specific area of your life. You will be able to make positive changes to your circumstances as these spiritual processes and technologies are simple to implement. For example, a student who moved to a new, densely populated city had only four days to find a suitable apartment. Using the numerical sequence process, he was able to find the perfect apartment, in the perfect location, with the perfect view, on the perfect floor, at the perfect price within the allotted time. In addition, the landlord was nice and trustworthy and the apartment was clean and neat and all the appliances were included and in perfect working order, exactly what he desired. As you expand your consciousness, your life will feel more harmonious in all areas. For example, after experiencing several sessions one man felt complete again. He reported that after nearly a year of being heavily medicated, his fog had lifted and he was no longer taking any anti-depressants, sleeping tablets, and anti-anxiety medication. You will begin to access higher realms of consciousness where your speed of healing, harmonizing, and manifesting will produce results faster. For example, one woman was bothered by neck and back pain for about two months. She spent $5,000 on a therapeutic mattress and expensive pillows that promised to solve her issue—without success. Finally, after trying several Grigori Grabovoi processes, her pain disappeared within 15 minutes and never came back. This is not “head work,” this is from the heart and you will only get the results you desire when you come from your heart space and allow the knowledge to flow through you.